It took several centuries for Buddhism to travel from India to Japan. Once Buddhism was established in Japan, however, it flourished. Buddhism had an incalculable impact on Japanese civilization. At the same time, schools of Buddhism imported from mainland Asia became distinctively Japanese. In the 6th century -- either 538 or 552 CE, depending on which historian one consults -- a delegation sent by a Korean prince arrived at the court of the Emperor of Japan. The Koreans brought with them Buddhist sutras, an image of the Buddha, and a letter from the Korean prince praising the dharma. This was the official introduction of Buddhism to Japan. The Japanese aristocracy promptly split into pro- and anti-Buddhist factions. Buddhism gained little real acceptance until the reign of the Empress Suiko and her regent, Prince Shotoku (592 to 628 CE). The Empress and the Prince established Buddhism as the state religion. They encouraged the expression of the dharma in arts, philanthropy, and education. They built temples and established monasteries. In the centuries that followed, Buddhism in Japan developed robustly. During the 7th through 9th centuries, Buddhism in China enjoyed a "golden age" and Chinese monks brought the newest developments in practice and scholarship to Japan. The many schools of Buddhism that developed in China were also established in Japan. Six schools of Buddhism emerged in Japan in the 7th and 8th centuries and all but two of which have disappeared. These schools flourished mostly during the Nara Period of Japanese history (709 to 795 CE). Today, they are sometimes lumped together into one category known as Nara Buddhism. The two schools that still have some following are Hosso and Kegon. Hosso. The Hosso, or "Dharma Character," school, was introduced to Japan by the monk Dosho (629 to 700). Dosho went to China to study with Hsuan-Tsang, the founder of the Wei-Shih (also called Fa-Hsiang) school. Wei-Shih had developed from the Yogachara school of India. Very simply, Yogachara teaches that things have no reality in themselves. The reality we think we perceive does not exist except as a process of knowing. Kegon. In 740 the Chinese monk Shen-Hsiang introduced the Huayan, or "Flower Garland," school to Japan. Called Kegon in Japan, this school of Buddhism is best known for its teachings on the interpenetration of all things. That is, all things and all beings not only reflect all other things and beings but also the Absolute in its totality. The metaphor of Indra's Net helps explain this concept of the interbeing of all things. Emperor Shomu, who reigned from 724 to 749, was a patron of Kegon. He began construction of the magnificent Todaiji, or Great Eastern Monastery, in Nara. Todaiji's main hall is the world's largest wooden building to this day. It houses the Great Buddha of Nara, a massive bronze seated figure that is 15 meters, or about 50 feet, tall. Today, Todaiji remains the center of the Kegon school. After the Nara period, five other schools of Buddhism emerged in Japan that remain prominent today. These are Tendai, Shingon, Jodo, Zen, and Nichiren. The monk Saicho (767 to 822; also called Dengyo Daishi) traveled to China in 804 and returned the following year with the doctrines of the Tiantai school. The Japanese form, Tendai, rose to great prominence and was a dominant school of Buddhism in Japan for centuries. Tendai is best known for two distinctive features. One, it considers the Lotus Sutra to be the supreme sutra and the perfect expression of the Buddha's teachings. Second, it synthesizes the teachings of other schools, resolving contradictions and finding a middle way between extremes. Saicho's other contribution to Japanese Buddhism was the establishment of the great Buddhist education and training center at Mount Hiei, near the new capital of Kyoto. As we'll see, many important historical figures of Japanese Buddhism began their study of Buddhism at Mount Hiei. Like Saicho, the monk Kukai (774 to 835; also called Kobo Daishi) traveled to China in 804. There he studied Buddhist tantra and returned two years later to establish the distinctively Japanese school of Shingon. He built a monastery on Mount Koya, about 50 miles south of Kyoto. Shingon is the only non-Tibetan school of Vajrayana. Many of the teachings and rituals of Shingon are esoteric, passed orally from teacher to student, and not made public. Shingon remains one of the largest schools of Buddhism in Japan. To honor his father's dying wish, Honen (1133 to 1212) became a monk at Mount Hiei. Dissatisfied with Buddhism as it was taught to him, Honen introduced the Chinese school of Pure Land to Japan by founding Jodo Shu. Very simply, Pure Land emphasizes faith the Buddha Amitabha (Amida Butsu in Japanese) through which one may be reborn in the Pure Land and be nearer to Nirvana. Pure Land is sometimes called Amidism. Honen converted another Mount Hiei monk, Shinran (1173-1263). Shinran was Honen's disciple for six years. After Honen was exiled in 1207, Shinran gave up his monk's robes, married, and fathered children. As a layman, he founded Jodo Shinshu, a school of Buddhism for laypeople. Jodo Shinshu today is the largest sect in Japan. The story of Zen in Japan begins with Eisai (1141 to 1215), a monk who left his studies at Mount Hiei to study Ch'an Buddhism in China. Before returning to Japan, he became the dharma heir of Hsu-an Huai-ch'ang, a Rinzai teacher. Thus Eisai became the first Ch'an -- or, in Japanese, Zen -- master in Japan. The Rinzai lineage established by Eisai would not last; Rinzai Zen in Japan today comes from other lineages of teachers. Another monk, one who studied briefly under Eisai, would establish the first permanent school of Zen in Japan. In 1204, the Shogun appointed Eisai to be abbot of Kennin-Ji, a monastery in Kyoto. In 1214, an adolescent monk named Dogen (1200 to 1253) came to Kennin-ji to study Zen. When Eisai died the following year, Dogen continued Zen studies with Eisai's successor, Myozen. Dogen received dharma transmission -- confirmation as a Zen master -- from Myozen in 1221. In 1223 Dogen and Myozen went to China to seek out Ch'an masters. Dogen experienced a profound realization of enlightenment while studying with T'ien-t'ung Ju-ching, a Soto master, who also gave Dogen dharma transmission. Dogen returned to Japan in 1227 to spend the rest of his life teaching Zen. Dogen is the dharma ancestor of all Japanese Soto Zen Buddhists today. His body of writing, called Shobogenzo, or "Treasury of the True Dharma Eye," remains central to Japanese Zen, especially of the Soto school. It is also considered one of the outstanding works of the religious literature of Japan. Nichiren (1222 to 1282) was a monk and reformer who founded the most uniquely Japanese school of Buddhism. After some years of study at Mount Hiei and other monasteries, Nichiren believed that the Lotus Sutra contained the complete teachings of the Buddha. He devised the daimoku, a practice of chanting the phrase Nam Myoho Renge Kyo (Devotion to the Mystic Law of the Lotus Sutra) as a simple, direct way to realize enlightenment. Nichiren also believed fervently that all of Japan must be guided by the Lotus Sutra or lose the protection and favor of the Buddha. He condemned other schools of Buddhism, particularly Pure Land. The Buddhist establishment became annoyed with Nichiren and sent him into a series of exiles that lasted most of the rest of his life. Even so, he gained followers, and by the time of his death, Nichiren Buddhism was firmly established in Japan. After Nichiren, no new major schools of Buddhism developed in Japan. However, the existing schools grew, evolved, split, fused, and otherwise developed in many ways. The Muromachi Period (1336 to 1573). 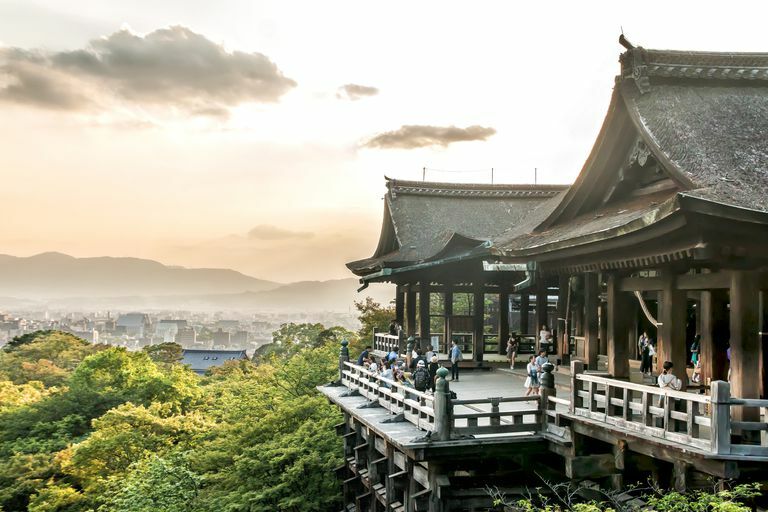 Japanese Buddhist culture flourished in the 14th century and Buddhist influence was reflected in art, poetry, architecture, gardening, and the tea ceremony. In the Muromachi Period, Tendai and Shingon schools, in particular, enjoyed the favor of Japanese nobility. In time, this favoritism led to a partisan rivalry, which sometimes became violent. The Shingon monastery on Mount Koya and the Tendai monastery on Mount Hiei became citadels guarded by warrior monks. The Shingon and Tendai priesthood gained political and military power. The Momoyama Period (1573 to 1603). The warlord Oda Nobunaga overthrew the government of Japan in 1573. He also attacked Mount Hiei, Mount Koya, and other influential Buddhist temples. Most of the monastery on Mount Hiei was destroyed and Mount Koya was better defended. But Toyotomi Hideyoshi, Nobunaga's successor, continued the oppression of Buddhist institutions until they were all brought under his control. The Edo Period (1603 to 1867). Tokugawa Ieyasu established the Tokugawa shogunate in 1603 in what is now Tokyo. During this period, many of the temples and monasteries destroyed by Nobunaga and Hideyoshi were rebuilt, although not as fortresses as some had been before. The influence of Buddhism declined, however. Buddhism faced competition from Shinto -- the Japanese indigenous religion -- as well as Confucianism. To keep the three rivals separated, the government decreed that Buddhism would have first place in matters of religion, Confucianism would have first place in matters of morality, and Shinto would have first place in matters of state. The Meiji Period (1868-1912). The Meiji Restoration in 1868 restored the power of the Emperor. In the state religion, Shinto, the emperor was worshiped as a living god. The Emperor was not a god in Buddhism, however. This may be why the Meiji government ordered Buddhism banished in 1868. Temples were burned or destroyed, and priests and monks were forced to return to lay life. Buddhism was too deeply ingrained in Japan's culture and history to disappear, however. Eventually, the banishment was lifted. But the Meiji government was not done with Buddhism yet. In 1872, the Meiji government decreed that Buddhist monks and priests (but not nuns) should be free to marry if they chose to do so. Soon "temple families" became commonplace and the administration of temples and monasteries became family businesses, handed down from fathers to sons. Although no new major schools of Buddhism have been established since Nichiren, there has been no end to subsects growing from the major sects. There was also no end of "fusion" sects compounded from more than one Buddhist school, often with elements of Shinto, Confucianism, Taoism, and, more recently, Christianity tossed in as well. Today, the government of Japan recognizes more than 150 schools of Buddhism, but the major schools are still Nara (mostly Kegon), Shingon, Tendai, Jodo, Zen, and Nichiren. It is difficult to know how many Japanese are affiliated with each school because many people claim more than one religion. The End of Japanese Buddhism? In more recent years, several news stories have reported that Buddhism is dying in Japan, especially in rural areas. For generations, the many small "family owned" temples had a monopoly on the funeral business and funerals became their chief source of income. Sons took over temples from their fathers out of duty more than vocation. When combined, these two factors made much of Japanese Buddhism into "funeral Buddhism." Many temples offer little else but funeral and memorial services. Now rural areas are depopulating and Japanese living in urban centers are losing interest in Buddhism. When younger Japanese have to organize a funeral, they go to funeral homes more and more rather than Buddhist temples. Many skip funerals altogether. Now temples are closing and membership at the remaining temples is falling. Some Japanese want to see a return to celibacy and the other ancient Buddhist rules for monks that have been allowed to lapse in Japan. Others urge the priesthood to pay more attention to social welfare and charity. They believe this will show that Japanese that Buddhist priests are good for something other than conducting funerals. If nothing is done, will the Buddhism of Saicho, Kukai, Honen, Shinran, Dogen, and Nichiren fade from Japan? Who was Kukai in the History of Buddhism?